Località Calabona, 07041 Alghero, Italy. 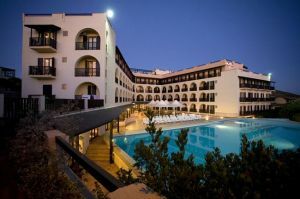 The Calabona Hotel is located in the lively and fascinating town of Catalonian origin and allows you tio visit its monuments, its restaurants and its shops nearby the sea side on foot. 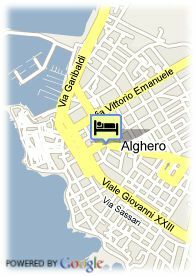 Its 110 light guestrooms are very nicely furnished providing comfort, elegance and functionality to the guests. The hotel is also the ideal place to hold congresses and reunions, having a big salon with capacity for up to 350 people and various smaller rooms, fully equipped, as well. Its restaurant offers cared service and a perfect cuisine, with a great variety of traditional local and regional, national and international dishes. Moreover, it also has two outdoor swimming pools, one for kids and the other for adults. It was partially renovated in March 2009. The renovated rooms have color TV LCD.